Those heading back to work for the first time after a warm and cosy winter break will be hit with frosty weather as the mercury struggles to rise above freezing today. 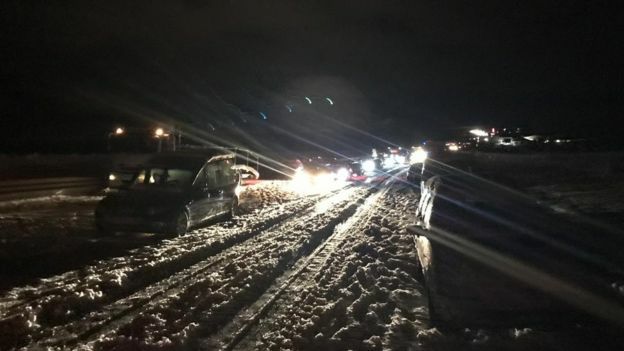 Heavy snow has caused travel chaos in parts of Germany and Austria as authorities closed roads and train routes due to the threat of avalanche and airports cancelled flights. Why so much snow for Europe? If you were thinking 2019 was going to bring nicer weather conditions in the UK compared to last year, think again. Run for the hills, buy stacks of bread and stock up on quinoa, London has experienced a few flakes of snow. The Arctic blast has arrived and while it’s business as usual across much of the rest of the country, the capital could be crippled by the conditions. Many commuters were forced to clear ice off their cars this morning as temperatures across the UK plummeted overnight. The mercury got as low as -6°C in Surrey last night, in Scotland it dipped to a very chilly -9.6°C and forecasters have warned that plunging temperatures and disruptive snow will continue. A weather warning for wind has been issued for North Wales this weekend. Gusts of up to 65mph are expected to hit coastal regions with wind speeds of 50mph possible inland. Forecasters have issued a yellow weather warning covering the whole of Wales which runs from Saturday 9pm to Sunday 12noon. Up to 10,000 households and businesses across the country are without electricity this morning, following high winds overnight. The ESB has apologised for the outage, saying the issue is mainly affecting those in the North West, Mid West and South West. After the temperatures last week plummeted to a seven-year UK low of -15.4C in Scotland, there was a bit of let up over the weekend as the sun shone on parts of the country. Dozens of homes have been left without power and trees are down as gales sweep Cornwall. Gusts of over 70mph were recorded overnight, with that wind warning out across rush-hour. There was a big power cut in the Tintagel area in the early hours of Thursday morning. Liverpool is set to be hotter than TURKEY this weekend as temperatures hit double figures. Yesterday saw the warmest Valentine’s Day since 1998 in the UK, with temperatures uncharacteristically high for this time of year. National news websites have been reporting that a 'Sahara heatwave' is set to hit the UK in the next few days, with record temperatures making the country hotter than Australia. They explained that temperatures will potentially be eight or ten degrees above average thanks to a flow of air from the Canary Islands. That was interesting to see and also how the UK Met Office explained it so the media had no need to inflate their headlines. "hotter than Australia" That's not going to happen. The UK February record is not quite 20C. "Hotter than Australia" is a very strange thing to say (to be polite).